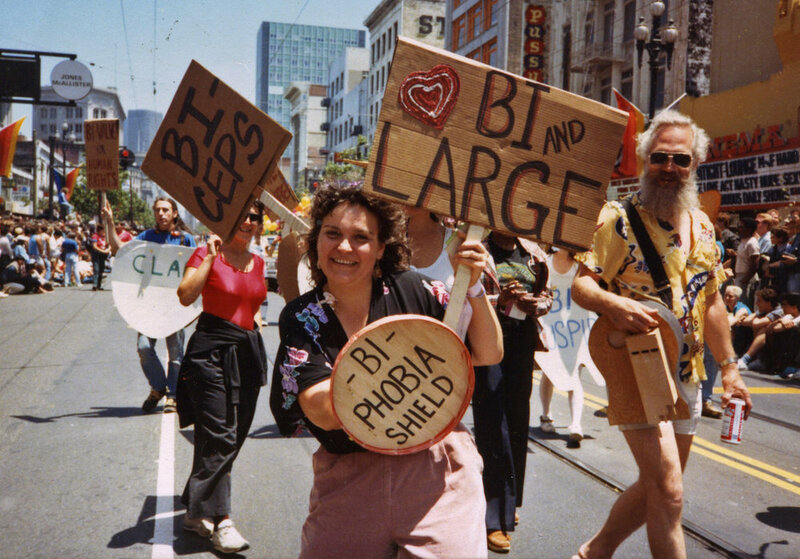 Arlene Krantz, BiPOL co-founder Lani Ka‘ahumanu wields her “Bi-Phobia Shield” as she marches with her contingent in the 1984 Lesbian and Gay Freedom Day Parade (1984). Left to right: BiPOL co-founder Bill Mack, Lynne Frawley, Ka‘ahumanu, unknown. “BiConic Flashpoints” told the story of the San Francisco Bay Area’s bisexual activism, which since the 1970s has been grounded in the politics of visibility, accountability, and vitality. A playful spirit has mixed with a seriousness of purpose at key moments across four decades, fueling today’s dynamic global bisexual movement. The exhibition featured never-before-displayed video, artifacts and photographs from the GLBT Historical Society’s archival collections and the personal holdings of bisexual leaders. Founded in 1976, the Bisexual Center in San Francisco was a beacon of visibility and support. In 1984, the recently formed BiPOL registered and ran a Vice Presidential candidate at the Democratic National Convention, resulting in the first-ever public Bisexual Rights Rally. In 1990, BiPOL convened the first National Bisexual Conference to organize BiNET USA as well as producing groups for Jewish bisexuals and bisexuals of color. In 2008, bisexuals facing erasure in the “gay marriage” debate engaged in “unVEILing injustice,” which moved LGBTQ organizational and media language toward greater inclusivity and accuracy. Lani Ka‘ahumanu is a BiPOL founding organizer, co-editor of Bi Any Other Name, activist, poet, educator, performer and visionary grandmother. Martin Rawlings-Fein is a published author, a bisexual and trans activist, a filmmaker and a Jewish educator studying to become a rabbi. Lindasusan Ulrich is a writer, musician, activist and future Unitarian Universalist minister dedicated to a vision of radical welcome.